If you want to mountain bike down an active volcano while holding a cobra in one hand and an ancient druid sculpture in the other, there’s likely a trip for you within the adventure travel industry. These guys know how to create the type of visceral experiences that make you want to update your Facebook page with four times the ordinary number of exclamation points. So, I was pretty excited when I hooked up the Adventure Travel Trade Association, and RESMARK Systems to put together the largest study on global use of social media by adventure travel companies. (Note that RESMARK is the company behind the killer automated story harvesting program I blogged about a few weeks ago). We collected social media data and insights from 225 adventure travel companies from every continent except Antartica (luddites), and interviewed several organizations about the details of their day-to-day social media usage. 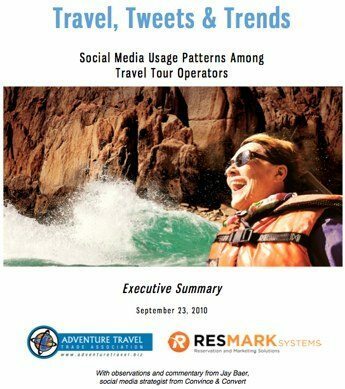 I hope you’ll consider picking up a copy even if you’re not in the travel industry, as I included several pages of recommendations and best practices for social media that apply almost universally. In North America, 48% of adventure travel companies are active in social media on a daily basis, and 77% are active at least weekly. Social media is used more in North America than in other parts of the world, but social media listening is actually more prevalent elsewhere. Here in North America, we’re prone to use social media more for proactive offers. Despite having a high inherent “talkability level” – where customers want to share their experiences socially, the adventure travel business is similar to most other industries in that the impact of social on the bottom line is largely unclear. Budgets for social media are minuscule, and most companies have just one or two people working on their social media program. However – and this was very interesting to me – many of the most successful social media efforts are also the smallest. Compared to each of the major social media tactics (Facebook, Twitter, YouTube, et al), email marketing is still seen as the most effective in driving business results – which actually isn’t a surprise given what I’ve been writing lately about the integration of email and social. There’s so many other interesting tidbits I want to share, but my research co-authors will kill me if I give it all away here. The report also contains case studies based on interviews I did with Sacred Rides, International Expeditions, Western River Outfitters, and Northern Outdoors – all of whom are seeing eye-popping success with specific social media executions. It’s a lot of fun to document the impact of social media on an industry that’s absolutely perfect for the type of kinship-building and storytelling that social media success is built upon. If you get a chance to purchase it, please let me know what you think of the research. I’d like to do more of that kind of work, and your feedback would be very valuable to me.